Photo: Francis (Frank) and Eunice Smith House, ca. 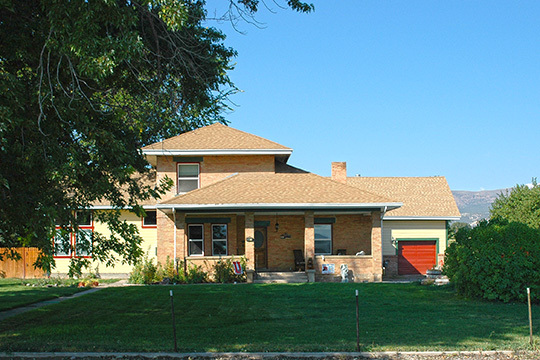 1913, 1848 North 3000 West, Maeser, UT. Listed on the National Register of Historic Places in 2001. Photographed by user:Tricia Simpson (own work), 2010, [cc-by-3.0 (creativecommons.org/licenses/by/3.0)], via Wikimedia Commons, accessed April, 2015. Uintah County administrative offices are located at 52 East 100 North, Vernal, UT 84078; phone: 800-966-4680. Uintah County was established in 1880 from part of Wasatch County. It is named for a band of Native Americans (Utes) who once occupied the area. Uintah County Commission, Uintah County General Plan 2005, 2012 amended, www.co.uintah.ut.us, accessed April, 2015.